For anyone dealing with R12 Subledger Accounting (SLA) configuration and troubleshooting, it can be helpful to understand how the SLA Accounting Methods Builder (AMB) Components are organized within the XLA schema of the R12 database. 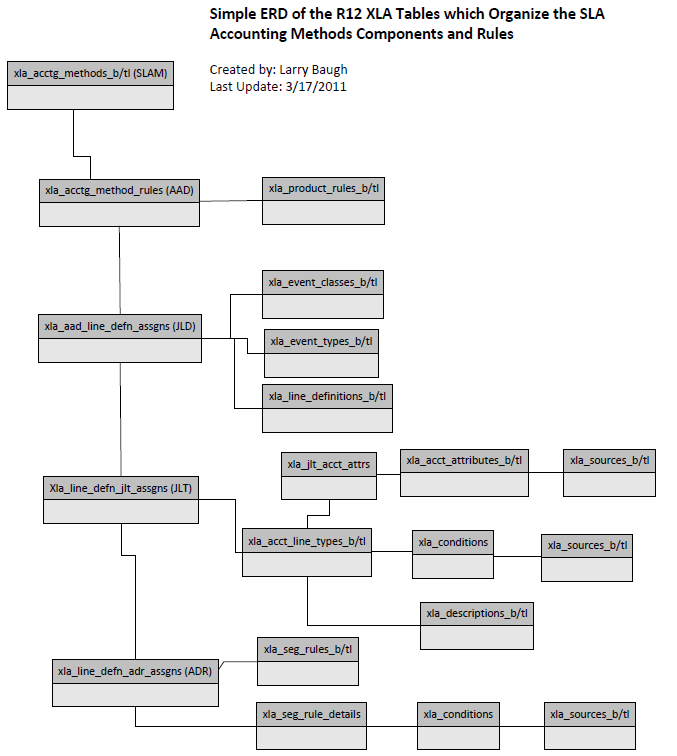 Here’s an Entity Relationship Diagram (ERD) I’ve put together as a tool to utilize when needing to build queries of most SLA configurations. This doesn’t encompass every type of SLA component (e.g. it doesn’t include Business Flow data), since I focused it on just the AMB Components I deal with the most, but includes the major components. In addition, here’s the SQL from a SQL Developer report I’ve developed to provide a data extract from the above which documents most SLA configs: SLA JLT and ADR Detail for AMB Components SQL. Its a good one. Keep it up.